To add dimension and depth to this beautiful flower stamp, I used primarily a white colored pencil to color the petals. Then I used a bit of purple to add contrast and make the flowers pop. It is a simple yet sophisticated sympathy card and I hope you give this technique a try. Stamp onto colored card stock rather than white and then use a white colored pencil to shade. Don't forget to share your creations on the Sin City Fan Page. 7. white card base 6x6"
1. 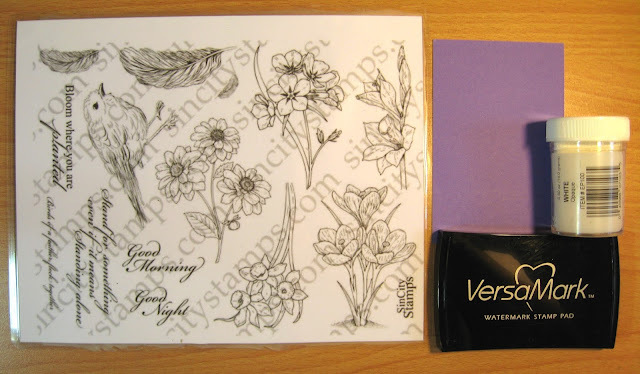 Use watermark ink to stamp the flowers onto lavender cardstock. Stamp two impressions so that you can cut out the petals of the second image and adhere them with foam tape for added dimension. 3. Color the embossed images using colored pencils. Color the center of the flowers with gold ink. Note: The right flower shows the white shading. 4. Carefully, cut out the front petals from each flower. Align the petals and reassemble the flowers. Use dimensional foam tape to adhere them to the complete image to create dimension. 5. Tear the bottom edge of the lavender panel and ink the edge with gold ink. Adhere the flower panel to a piece of white cardstock. 6. Next, tear the lower edge of yellow cardstock and ink the edge with gold. Then, matte it behind the flower panel. 7. Adhere the panel to the left side of a square card base. 8. 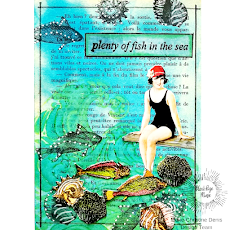 Use watermark ink to stamp the word "friends" onto the lower right corner of the card base. Gently apply lavender chalk over the sentiment with a cotton puff.